Since their founding on May 21 2013, it’s been a long wait for NYCFC’s historic first match and the day finally arrived yesterday as the Major League Soccer season got under way. Of the 12 new teams that have arrived into MLS since the league’s first season back in 1996, only four have won their opening fixtures. However, New York City FC were taking on a fellow newcomer in Orlando, so both clubs were in the same boat going into this fixture. 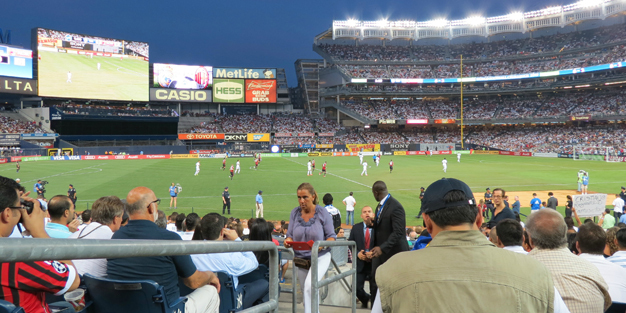 With newly-assembled squads, featuring a World Cup winner on each side with Kaka and David Villa, an intriguing game was in prospect in front of 62,000 spectators waiting to see which of these new sides would get off to the perfect start. It was the second-largest attendance for an MLS game in the history of the competition, beaten only by the 69,000 who crammed into LA Galaxy’s first game at the Rose Bowl. It was an understandably cagey opening to the game, considering the teams would have known precious little about one another but the home team looked successful in cutting the midfield supply line to Villa. Kaka was the architect of Orlando’s attacks in the first half, linking the play and taking all the set-pieces, but it was his powerful shot that proved the most dangerous moment of the first half. Molino rolled the ball into his path and he smashed a first-time effort towards goal which NYCFC keeper, Saunders did well to parry away. NYCFC had what was arguably the best chance in the 52nd minute when Villa finally escaped the attentions of a resolute Orlandodefense and was inches away from turning home a Williams cross which flashed across the face of goal. The away side continued to grow into the match and had another good opportunity to take the lead on the 64 minute when Villa delivered a perfectly weighted through ball to second half substitute Khiry Shelton but his shot across goal flew a yard past the far post. On 76 minutes, the increased pressure from the away team finally paid off as Spain icon David Villa poked the ball in the direction of Diskerud who then open his body and curled home a sublime right-footed shot from just inside the area. It was a stunning strike that will be replayed for many years to come. The task of holding on to the advantage looked to have gotten even easier when Orlando defender Collins was quite rightly given a straight red card for a dreadful high challenge on Villa with seven minutes to go. The NYCFC captain was thankfully unhurt and curled the resulting free-kick just past the post.